It’s day 2 of 2016. Unlike many who met the day with spanking new outfits and freshly fluffed optimism, I spent day 1 in my pajamas, transitioning into the new year with a touch of internal friction. The night before was fitful at best; there were fireworks too close to my once idyllic and quiet home (yes, I’m one of the weirdos who enjoys meeting the New Year quietly). There was haze where once was clear, unsullied sky. I did not have a peaceful sleep and woke up feeling sluggish and unenthusiastic. The only bright thing ahead were my pink polka dot pajamas. So I stayed in them. All day. That’s how I’ve come to look at our Christmas tree: our story tree. We finished decorating today, two days earlier than usual. When the children were smaller, the tree would suddenly appear on Christmas morning, trimmed and lit. Now that they are older, they ask to help me decorate and do it earlier so that they can have more time to behold it, before they leave for Christmas with their father. Today, I basked in memories shared as each ornament was retrieved from its sleeping place. “Oh,” someone exclaimed, “we made this in the first grade!” I feigned tears and sobs as I held up the photo ornament of my teenager’s first Christmas. My firstborn. He was five months old. Yes, I dressed him in an outfit complete with a black vest and a tartan bow tie. He was my best Christmas present that year. He was Christmas. That is forever immortalized on our tree. My younger son, who is always the one who asks when we will trim our tree, went for the little wooden figures given by a friend many years ago. He has started his own tradition of going for them first, hanging a few on the tree, and then sitting down to play with them, forgetting the main task. We always have to lure him back to the tree. This year the boys tried to put each other’s photo ornaments on the back of the tree where no one would see them. The younger one called the older one mean even as he did the same, and the older one took it as a compliment. Gone are my days of decorating alone in total peace and quiet. This was new and it was all good. As we recalled the story behind each ornament, we created new memories, new stories we laughed over. I wonder which ones we will remember when we lift our little treasures out again next year. They are not just ornaments anymore, but keepsakes that tell a little something about our past and are placeholders for more stories in our future. There was a time when my artificial tree was shiny and full, lit from top to bottom, trunk to tip with electric bulbs. I had beautiful ornaments bought by the dozen. I had different sets, too, from the time I had a blue theme, to the time I found a source of very pretty clear ones with artistic swirls on them. I even had plastic grapes that captured the light in a very enchanting way. They were all wonderful, colorful, and random; beautiful yet empty. My trees spoke of sophistication and polish, but none of those ornaments could have told the stories of the simple ones I own today. They have been accumulated over time, some of them handmade by the boys, me, beloved aunts and teachers. Each one has a story, was given by someone who was in our life at one point or another, or was bought with real care and thought. On the eve of the 24th, when the boys are fast asleep, I will finally put the fresh roses on. This I still do myself and they will wake up to the heavenly scent of beeswax and roses–the smell of our Christmas. Our tree tells the story of a life made simple, a life made real. I am always grateful for this tree and for being able to review the story of my family every year as we say goodbye to the old and usher in the new. This is an article I wrote in 2007 that I feel impelled to share after I saw a friend tweet something about “broken” families. I’ve never been comfortable with that term. I think it assumes too much. Here’s my take on it. Please feel free to pass it on. During a recent parent get-together, I realized that the modern world has really changed the constellation of families. There are a lot more complex family situations than there are “normal” ones. Which brought me to the question, “what is normal anyway”? Father, mother and children living under one roof doesn’t guarantee normal and normal doesn’t necessarily mean healthy. Today there are many single-parent homes, not just because the modern Filipina is more independent, stronger, and less inclined to suffer the transgressions of her husband, but because one or the other spouse has gone abroad to work. Children are growing up with a different sense of family, what with fathers having to mother their children and mothers having to double up as dad as well. If we simply look at the picture and add into the formula our ideas and mainstream definitions of “normal”, we would immediately conclude that the Filipino family is headed for disaster. But it doesn’t have to be. There is much hope to be found on the other side. Other family members are stepping in. Estranged couples are now more willing to deal with each other with respect and love despite their obvious differences. They bring their current partners into the picture, creating a new web of parenting and friendship that is borne of acceptance and maturity. The whole family learns a whole new way to love. It is not without its difficulties, but I find a tremendous opportunity for humanity there. Today, children are experiencing deep levels of love and nurturing from people who are not related to them by blood. Blood-love is automatic and expected. Nature takes care of that. But love that is consciously bestowed upon another human being with whom one is not blood-related—that is a gift of unfathomable value. That is the foundation of true brotherhood. Of course this doesn’t just happen. Things can certainly go awry and the worst possible outcome for the children can still happen, but adults who are willing to take the broader view can make such family situations harbingers of hope rather than despair. In the past, divorced couples behaved abhorrently towards each other, dragging the children into the fray and causing irreparable emotional wounds in the family. Today, more conscious adults are taking stock and deciding there is a better way to do things. More and more divorced couples are choosing to be friends and their children are faring better. A gifted child psychologist told me that in all her years of practice, children have repeatedly said that they didn’t mind that their parents were separated, as long as they could be friends. That is a true gut-wrenching challenge for separated couples. If they have gone as far as divorce or separation, it goes without saying that there is much pain between them. But if they are striving with all their might to find areas of understanding where they can be authentic yet kind to each other, the children learn a valuable lesson of respect and true human striving that will serve them well in their own lives and relationships. When the couples find new partners and are in stable relationships that they deem worthy of the children, the family expands. Today, I am discovering that there is a trend towards couples being truly accepting of their former spouse’s new partner, which means less emotional strain for children who don’t have to feel disloyal about liking someone in papa’s life who is not mama, or loving someone in mama’s life who is not papa. The most famous example would be the Ashton Kutcher-Demi Moore-Bruce Willis triad. The world has seen this hyper-extended family at social gatherings and even on vacations together. Some react with horror but others are open enough to say, “Why not?” With this new consciousness, children can see that love can be expressed in many ways. I believe that any kind of fragmentation is a call for just that. Something that is crushed cannot be restored to its original form, but you can create something new out of it—something, at least, made stronger by the fall. The ability to hold together that which has been cracked and crushed takes tremendous strength. That strength would not have risen on its own. But not everyone chooses to see the gifts that emerge from the chaos. Indeed, this takes new vision—an ability to see with unbiased clarity. My parents separated when I was two years old and I swore that would never happen to me or my children, but today I see that what happened to me as a child prepared me for what I needed to go through in adulthood. It is a different view of my past that I was unable to see before. The threads of life are woven way, way before our present perception, and we really do have to be willing to view current life events with an openness we may not have had before. If we limit ourselves to “socially accepted” views of the world, we deprive ourselves of the chance to see the many facets of life, each possibility as brilliant as the next. My parents’ imperfections taught me the value of living truthfully. I’m not even sure this was a lesson they wanted me to learn, but that is definitely what I got out of our family history and it has served me well. Truth-telling and truth-living have become my personal motto. Though their separation caused deep wounds, these had more to do with the way they were towards each other afterwards, rather than the separation itself. Whatever it was, I believe I was able to make the most of our situation and, as a conscious adult at last, I am able to appreciate its gifts. Couples whose jobs cause them to live apart have to deal with their own set of issues. Yet, I have seen communities rally around these families and give them support. I have seen individuals volunteer their time to give the custodial parent space to breathe, and to provide the children with a different kind of adult influence and input. Again, much depends on the consciousness of the parents who choose to give their children something new and seemingly out of norm, but will enrich their children’s life in unexpected ways. The positive aspects of complex family situations are revealed only when we study them with an open heart and mind. If we focus on what should be rather than what is, we always fall short. If we look at what isn’t there and not at everything or everyone else there, we will see only what is missing. But if we look at these situations and acknowledge that present circumstances can bring grace rather than disgrace, there is much to see. The view can be almost dazzling. When I was little, a child asked me if it’s true that my family was “broken” and of course I said it wasn’t. My family was never broken, it was just different. Just like any other family today with its own special constellation, mine had its share of heartache and joy. But it was a family just like any other, with its own set of unique challenges. No matter how hard we hope and try to have our families be like the television families of the fifties and sixties, life happens. It has its own ingenious design. If you haven’t already noticed, it does not come in a tidy box. Life is pretty messy. It is really up to us to see the beauty in the chaos. Our families are taking on a different shape. To make the most of these complex situations, we have to step out of our limited view of what ought to be. We have to accept that the world is changing and our families along with it. So stop calling it broken. Stop whispering about it. Today’s modern family can show us just how wide and deep love can grow. I am not one for parties. I never have been. I’ve organized only two birthday parties of my own: my sixteenth and thirty-fifth, and I have to say they weren’t big by any measure. I have not had any big to-dos since. My older son is much like me. Every year, we celebrate his special day quietly, sometimes he’ll have a friend or two over, but that’s it. For his fourteenth, he asked for Tita Mae’s special sinigang and super adobo and I made sure he had a delicious chocolate cake. He wanted to invite our two other constant boys, but they were abroad. Just us, then. And it was grand. This year, being his last before he moves to a different high school, he was encouraged by his father to have a party at last and invite friends over. He acceded and I only heard about it when they came home after the usual weekend with their dad, after having already given out the invitations. And that’s when all the earnest mealtime discussions between him and his little brother began. His classmates have younger siblings, and some assumed they were invited as well, though they apparently were not given invitations. I can’t blame them as it is a small school and some get-togethers in the past simply included everyone. My younger son, the party guy, invites more people and doesn’t mind so many people about. My older boy is a little more circumspect. He worried when he found out cousins were invited as well. He didn’t want to leave anyone out, but he also didn’t want to have to be away from his classmates, or to have to divide his time. He was torn when asked if a good friend and his brother were invited, because he hadn’t planned on it. His focus was really to spend time with his classmates. He said he didn’t want to have to worry about other children. He wanted to just be with his band of friends for once, because it was the first and last birthday party outside of school with them before they all went their separate ways. I encouraged him to stand for what he truly wants. I told him it was his own celebration after all. I am proud that he wants to be fair and that he doesn’t want to offend anyone, but I am more proud that so far he has held strong for what he wants. I don’t agree with our culture of inviting everyone and their mother to life milestones just because “nakakahiya” or “sasama ang loob”, because to me it takes away from the substance of the celebration. Celebrations are expressions of the soul and I want my children to be as authentic as they can about it, to feel empowered that they can keep things small, simple, and just the way they like it. I go against elaborate celebrations with people you don’t know who are there just because you couldn’t say no. I like my own family celebrations to be full of people I know, like and love. I want the same for my children. I listened to many conversations between my sons as they threshed out the logistics of this little event, and I was proud that even my younger one understood exactly where his brother was coming from. I felt as though a whole new world was opening up, even for him. He was fully aware that his brother had a different set of needs for this celebration and seemed to have the utmost respect for it. He had one invite for a friend and he chose carefully, bearing in mind his own brother’s goals. I had to laugh inside when he then started asking me how so-and-so ended up at his last party when he didn’t even know them. I was happy to be able to say I had no idea. I don’t practice that at home and I make sure my kids’ celebrations have only their friends in it. I feel this is a rite of passage for my son, and as his mother I look on with pride as he battles with issues of loyalty, the desire to please everyone, his own emotions, and the struggle to find clarity in his heart to go for what he feels is right. A man who can hold his own against the pressures of conformity is a man who can open the door to change, even as the rest of the world clings to the old. There is nothing I want more for both my sons. It isn’t just a party after all, is it? It is the most rewarding, yet difficult job of all. This morning I had but a moment of warmth and joy. I have it each time I wake my youngest (my older boy is already up and reading when I come out of my room) and I see him asleep, one of two angels somehow entrusted to me in this life. I slide into his bed, appreciating the warmth and enjoying the sleep-smell of him. It’s heaven. Then he raises his hand to cradle my chin or grasp at any part of me in greeting, before he draws me into a hug and a kiss. This little ritual is a thing of joy and I wish motherhood were all about that. But it isn’t. About a half hour later everything changed. As I told them about dinner with the family tonight in Alabang, the little one’s face clouded. “But I have violin lessons! I want to come home first.” But there was no time for that. He withdrew and was cold and we had breakfast in this atmosphere of emotional sludge, which then drove me to not only eat a croissant (I’ve been off bread for some time), but to dunk it violently and repeatedly into a demitasse of rich Valrhona chocolate. I have been struggling with an increasingly hectic schedule for them. They have Kung Fu lessons after school, which they love, but twice a week was feeling a bit much, because there are violin and flute lessons for the younger one, and now there are violin and extra lessons for the older one, who is preparing for high school entrance exams. Take away Kung Fu then. No, they protested. Okay, two hours Monday and no more Wednesday. We thought that was a good compromise but they came home too exhausted and announced “Two hours on Monday is too much because we also had P.E. today and it was really tiring.” So they woke up tired and grumpy this morning. So, now we’re calibrating again to find a balance somewhere, but something has to give. This morning was a give moment and I expect more of it until we find the right mix of rest, activity and recreation, a healthy breathing in and breathing out. 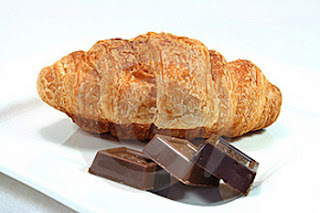 In the meantime, I am hurled back and churned out constantly by the emotions that accompany life changes and difficulties, and I have to remind myself that the croissant and chocolate help nothing, least of all my middle-aged thighs. Anything that requires helmets has never been my thing. 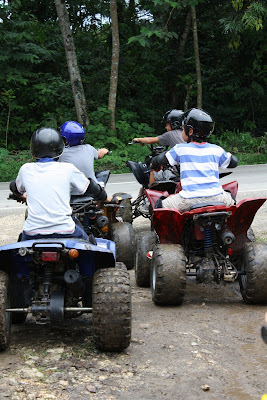 I thought about that as I painstakingly navigated my very first ATV (all-terrain vehicle) through the Bohol countryside. It occurred to me, out in the middle of nowhere, that my automatic shunning of any activity that needs head gear might be traced to the death of a much loved uncle, one of my mother’s favorite cousins. Tito Benny was young, warm, funny, and father to gorgeous twins. As a child, I remember the bottomless grief that surrounded us during his funeral and the strange siren sound that filled the chapel on the last day. It was his widow’s wail–an ethereal sound I will forever associate with pure pain. That was my first lesson on loss and it was a hard one. But our children lead us to untold destinations and on this particular trip, my boys brought me to this place of reckoning: a vehicle that required a helmet. I suppose it can be described as a motorcycle with four wheels and that gives some kind of consolation when that’s all you have on your side. I tried to scan the place for any other kind of vehicle that didn’t require me to learn a new skill or don the dreaded metal head wrap, but the only tandem ride they had was under repair. I wasn’t about to lose sight of my boys or hand them over blindly to the locals just because I didn’t like the idea of helmets and rides. So, at the ripe middle age of 44, I donned a smelly helmet and got on the thing with wheels. The first thing they make you do is drive the ATV on a little practice trail. Of course I drove straight into the grass and knocked down a wooden pole; I forgot that brakes are useful things. You press them and then you stop, hopefully before you destroy property or body parts. I use my feet for brakes, but for this particular vehicle, that doesn’t work. Once I got my hard-wired brain around that detail, I was okay. D thinks I held everyone up with my lack of speed and skill, but I don’t think it matters. Our boys had a grand time. No one else complained. All they care about is that they got to drive their own ATVs. I saw a lot of butterflies on the way, too, and I don’t think anyone who zips through life for the sake of speed sees all the lovely details. I did. So I finally did the helmet-and-wheels combo, but I did not forget to take in the sights, the lush and lovely Bohol countryside, its mud and manure, but also the birds, butterflies and dragonflies, the children who waved at us, unaware of the threshold I was crossing, and the grandmother who flashed me a smile of solidarity. I’m thankful that the helmet, ATV and I had a life-giving experience. It made me remember Tito Benny and his wonderful laugh. D and I took our four boys on our first ever summer trip together. At first I explored bringing them to Misibis Bay but the cost was so prohibitive and went against my goal of showing them how to travel simply. 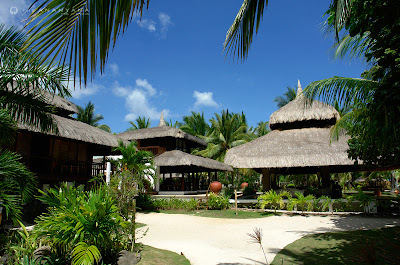 We checked out several resorts, but in the end we went for this little 12-room resort on Panglao Island, The Ananyana. We loved it. I love that it isn’t a concrete structure, but a series of huts that blend with nature. It’s simple and nicely done. The resort is over a decade old and could do with some sprucing up, but the rooms are still clean and comfortable. D and I took a regular room. We put our boys in a family room. The upstairs area of their room could use renovating. Though I appreciate the capiz doors and windows, there were holes in them that were taped over. They ought to repair that or change the finish. Our room had plain white walls which gave the room a welcome brightness. Our boys, who like to read, could have used some of that. We asked for better reading lamps for them instead, which the staff readily provided. I don’t know about you but I like to be able to fully close the bathroom door. Our bathroom had swing type little doors that belong more to a bar in a Western; it didn’t give much privacy. The kids had a large floor to ceiling curtain as their bathroom door, which gave some coverage but still not enough privacy. That would probably be the one thing I would change. It would also be nice if all resorts started using earth-friendly soaps, shampoos, cleaners, etc. This one uses Safeguard. On the upside, I discovered that Safeguard removes mud stains! Whoa! Still, I doubt it’s good for earth, foliage or sea. Other than that, we were all more than comfortable and enjoyed the simplicity and charm of the place. I loved the hammocks. The minute I saw them I knew I came to the right place. There are 5 of them in all. Even the kids enjoyed them. They spent a lot of time reading and swaying in the breeze. Sarap!! No beach trip is complete without the requisite “duyan” and I love Ananyana for making sure they had it. The service is good. We got to know our waiters Coro and Danny and one of the boat men, Eric, and the very helpful manager, Ruela. We joked that they might have thrown a party after we left because we had so many requests. They made every effort to grant them. I asked for my meals without rice, but with a salad instead. We asked for fresh juices without sugar. The menu could use more good salads with lots more greens, because you start to look for variety if you’re staying in a lot and for more than 3 days (we stayed 5 nights). We love the place anyway! And we loved it even more when we discovered there were no TV sets in the rooms. YES!! They have a small one near the dive shop with dvds to rent and the kids enjoyed Yogi Bear one afternoon. But that was it. 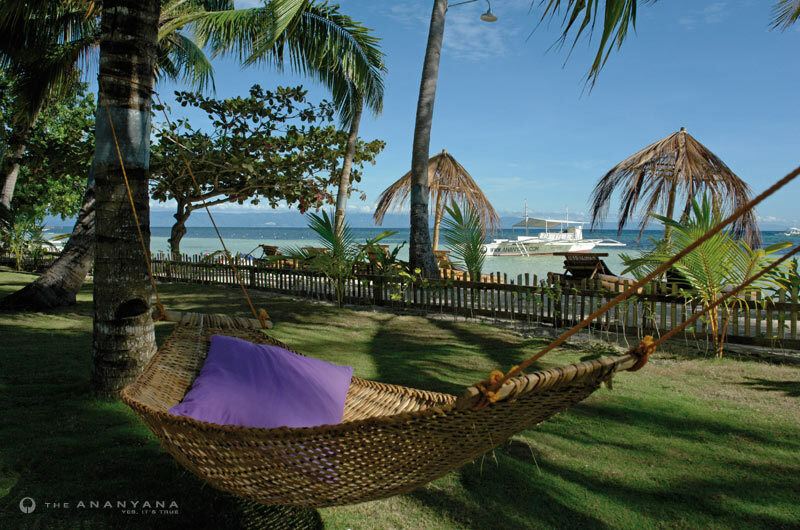 One of the reasons we chose the resort is its proximity to the beach. Though the water is very, very shallow for a long stretch, you can rent the resort boat to bring you to deeper waters for better swimming and great snorkeling. We booked tours through the resort and they were well organized and priced very well. The kids want to go back and D. and I wouldn’t mind it either. It’s harder and harder to find little places that are simple, clean, comfortable, nice and well run. The Ananyana is one such place. 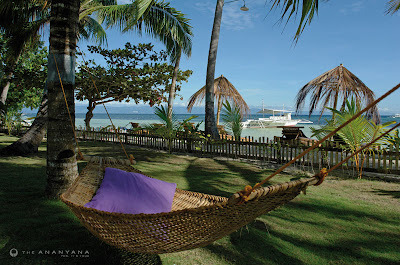 If you’re thinking of visiting Bohol, make sure you check it out. Yes. it’s the 45th anniversary of this wonderful film. I remember it well. It is also a very special film in our family because it’s the first my children ever saw. I watched the Oprah episode with the cast and found myself feeling quite sentimental and nostalgic. 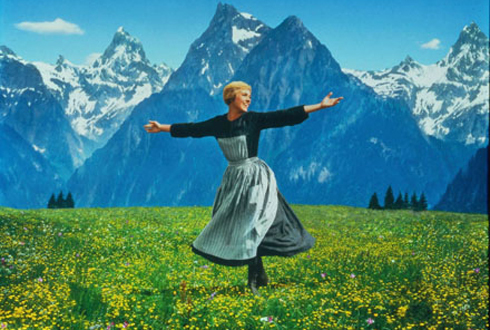 Seeing all the actors who played the Von Trapp children as adults makes one feel the passage of time. There were behind the scenes photos, too. The one that struck me the most was of a very young Julie Andrews holding the hand of her toddler daughter. That photo reminded me of how simple life was for actors at the time and also how actors were actors and not the stars and megastars they are today, constantly hounded by cameras–their bags, shoes, relationships, blings, successes, failures, faux pas, always scrutinized and broadcasted. You could be an actor then and have a life. How many of us even knew she was a young mother at the time? What did we really know about her? Today it’s all about too much information. Just a few nights ago, a local actress was interviewed and suddenly, somehow, they were talking about her underwear. Who wants to know? I certainly don’t. But the sad thing is, so many others do. The world today pushes information at you. It’s almost impossible to keep it out and many just keep wanting more, thinking nothing of propriety. How much do we really need to know? The challenge is to know that all that information is out there, but to be able to determine which ones hold water. I am guilty of the same in this day and age of Twitter and Facebook, but that one photograph brought it home for me. Simplicity, dignity–these do not have to belong to the past. I have been dreading this space since August 23. Like most tragedies that hit our nation, there are simply no words. I’m writing this to share some insights on internal factors that I feel were informing events at the Quirino Grandstand and on the internet. There was so much anger and blame online. I was part of it until I realized it wasn’t really accomplishing much. After feeling utterly useless and overstimulated by the horrible images, I turned everything off. I could not watch any more of the live coverage. I could not believe I was watching it blow-by-blow as it happened. I left the room and lit a candle for those who died–and for humanity in general–sending out all the love, comfort and warmth I could muster. A few minutes later, D. came into the room and sat with me in silence and prayer, exactly the way we do when someone we know has crossed over. We made a conscious effort to get out of the virtual world and engage in something human. Someone later tweeted, with an expletive or two, that he was tired of all the calls for prayer. What he wanted was action. Those who know the power of prayer, know it is action. Prayer (not the emotional asking for the moon kind) is thinking and reflection with compassion. At that moment, it was a very powerful deed. Nothing else would be accomplished online. As a people, I have observed that we are sorely lacking in boundaries. You see it in our geography, too. Water surrounds us, the earth constantly shifts beneath our feet and we like to be fluid and soft and warm. Our challenge is to create boundaries where needed. The police didn’t give it to media and could not muster enough for themselves. People around couldn’t keep away. The media got too close and, in my opinion, did not exercise enough restraint. I am all for reporting and bringing truth and facts across, but when lives are in the balance, delayed broadcast would be the better choice. Everyone wanted in on the action. Some people from media decided they could get close and interview the hostage-taker and voila, they did. Everyone wanted to do everything except step back and create boundaries. We need boundaries. We ought to have them in the form of laws, which we seem to be able to craft. But implementing and following them–these are difficult for us. I believe it is because most of us are extremely boundary-challenged. We don’t have the internal alarms that tell us when we are too close to the person beside us in the queue, or that the question we want to ask is inappropriate. We grandstand during hearings because we have a bigger sense of ourselves and none of the other. We grin and laugh during a hostage crisis because the cameras are rolling and somehow we’ve blurred the lines between virtual and real. We take souvenir shots of ourselves in front of the bus where so many lives were lost and post them online. We don’t care that the money we used to build our fortune — the one that allows our daughters to buy their exorbitantly priced designer bags — came from government. That means we robbed hardworking taxpayers. Did you feel that when you crossed the boundary? Did you know there was a boundary? Someone else tweeted that if we tried to figure out the motives of hostage-taker, we would end up going all the way back to his mommy. I think that was meant to be funny, but in the end I have to say, absolutely. As a mother, I make sure I raise my children to recognize boundaries. How? I create them. Discipline, consistency and integrity. Rules are clear. Consequences as well. And I try with everything I have, to be true to what I say. Whatever comes out of my mouth is followed through. I live what I preach. They see it and grow up in it. Strengthening these inner boundaries make up a well-structured moral life. Having a sense of where you stand and where others do is a healthy social skill to have. It is inside that we have to look to see what went wrong. Everyone wants to say enough talking, let’s start acting. Well, I have news for you, we can’t walk the talk if we haven’t figured out the talk. We need to connect the dots, see the relationships that make us whole as human beings and make sure that we are always walking that path of integrity. This brand of thinking is self-reflection towards conscious, purposeful and directed action. What ails this country can only be healed within. The future of this country depends on what we do today, inside ourselves, because that will inform how we behave and create and move in society. We start at home with ourselves and with our kids. Until then, we continue working furiously at outer structures that keep crumbling because the foundation we keep avoiding has long been rotten to the core.